One of the misconceptions bandied about in the alternative media is that Former Federal Reserve Chairman Alan Greenspan claimed in 2007 that the Fed was above the law, as this popular video indicates. He didn’t say that the Fed is above the law — he made the true claim that no other *agency* of government can overrule it, where agency means some other body created by Congress. Congress itself can get rid of the Fed, and should, because its purpose was to serve the big financial interests and not the interests of the people, such as limited state banking and usury-free community currencies would. 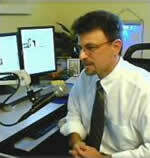 I was interviewed by Doug Newberry of Crisis of Reality on January 24, 2013. Here is the video, and here is the video of my January 9 appearance. In my most recent interview, I discussed the false choice between Keynesian and Austrian economics, how Alex Jones is to his audience what Rush Limbaugh was to his audience back in the 1980s, the strange bedfellows of Karl Marx and Ayn Rand, how the banksters are using the dialectic of non-commodity money vs. a so-called free market gold standard to arrive at their government-guaranteed gold standard, and how Marx, Keynes, Rand, Greenspan and Mises don’t implicate the parasitic usurer, despite some of them being seemingly opposed to each other on many issues.